The fine folks at Ideum (the developers of the ExhibitFiles site) are working on a project called "Open Exhibits"
To quote from Ideum's blog, "Open Exhibits is a project that will allow us to develop, test, and disseminate three open source software templates that will allow museum professionals’ to assemble electronic exhibits for the museum floor. The Open Exhibits templates, as well as the source code, training opportunities, and prototype exhibits, will be made freely available to museums. The exhibits will be built using ActionScript 3 and Flex." Where do you come in? Ideum is preparing a proposal for Open Exhibits to submit to the National Science Foundation, and would like as many people as possible to fill out a brief survey to help tailor the project to the needs of the field. 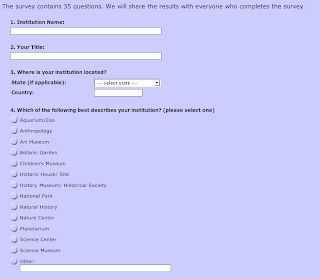 I'm sure we all will benefit from Open Exhibits, so fill out that survey now!